Tramp Oil Separator features compact design. Intended for use with water-miscible coolants and parts washing fluids, Master Coalescer Jr.(TM) works with CNC machines with small, hard to access coolant sumps. It includes removable media pack that provides up to 132 square ft of coalescing surface, and comes with electric 120 V diaphragm pump that primes to 48 in. Tramp oil separator is also available in portable model that features 2 rigid and 2 swivel casters and hinged pull handle with magnetic latch. Highly technical and efficient Master Coalescer Jr. offers cost-effective mid-range option. Perrysburg, Ohio, February 29 , 2008-Master Chemical Corporation, known as the originators of coolant recycling, has introduced a smaller version of the Master Coalescer II(TM) tramp oil separator. Sales have been brisk for the Master Coalescer Jr.(TM), a compact, affordable, and effective processor of machine tool coolants that meets the requirements of any metalworking plant. The Master Coalescer Jr. is manufactured by the Systems Equipment Division of The Andersons, Inc.
"The Master Coalescer Jr. was developed to meet a need in the marketplace," said Technical Support Representative, Ron Wendt, of the System Equipment Division of The Andersons, Inc. "The Master Colascer Jr. provides an efficient and highly technical-yet cost effective-midsize tramp oil separator," he stated. The machine removes tramp oils and provides clean, reusable coolant-paying for itself with extended coolant and tool life, improved machinability, and reduced maintenance. Tramp oils (hydraulic oils, lubes, or any undesirable oil) are a source of many of the problems associated with water-miscible cutting and grinding fluids. Removing the tramp oil from the coolant removes a food source for bacteria, reduces undesirable residues on machine tools and work pieces, and reduces smoke and oil mist in shop. According to Mr. Wendt, large, highly efficient tramp oil separators are priced at about $3,500. Small units cost between $400-$500, but are not considered efficient. 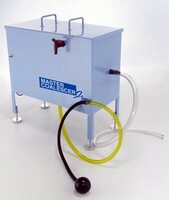 The Master Coalescer Jr. is designed for use with water-miscible coolants and parts washing fluids that "reject" tramp oils (chemical emulsion or chemical solution types.) Master Coalescer Jr. is not designed for use with chemical surface active types that emulsify tramp oils. According to Mr. Wendt, Master Coalescer Jr.'s compact design works with CNC machines with small, hard to access coolant sumps, requires minimum maintenance and provides maximum tramp oil removal while the machine is running. "Junior's" portability allows shared use on several machine tool sumps and the tramp oil separator's simplified operation requires less operator involvement. "The Master Coalescer Jr. has an electric, 120 volt diaphragm pump that primes to 48 inches," said Mr. Wendt. "This self-priming pump uses less energy, which offers cost savings," he stated. The Master Coalescer Jr. has an easily removable media pack that provides up to 132 square feet of coalescing surface. No adjustments need to be made and the new floating skimmer-only 3" in diameter-works in sumps as shallow as 1 ½" deep to collect oils and soiled fluids. The tramp oil separator is also available in a portable model with wheels. The portable Master Coalescer Jr. provides the same hard working performance but goes from one sump to another with ease. "Portable Jr." features two rigid and two swivel casters and a hinged pull handle with handy magnetic latch. The Master Coalescer Jr. was developed by Master Chemical Corporation and is manufactured and sold by the Systems Equipment Division (SED) of The Anderson's Inc. For more information visit Master Coalescer Jr., Portable Master Coalescer Jr., or call 419.891.2724. Master Chemical Corporation was founded on November 13, 1951. Since then, working closely with the worldwide metalworking community, Master Chemical Corporation has developed and marketed a full line of specialty cutting and grinding fluids, cutting oils, concentrated washing and cleaning compounds, and rust preventives all under the TRIM® Brand trademark. These products are both environmentally sound and when used in conjunction with Master Chemical's XYBEX® Coolant Recycling and Filtration Systems, are the most durable and stable products available anywhere today. For further information please contact a Distributor near you, visit www.masterchemical.com, or call us at 419-874-7902. Founded in 1947, The Andersons, Inc. (Nasdaq: ANDE) has established itself as a respected leader and prominent regional player in grain merchandising and plant nutrient formulation/distribution in the Eastern Corn Belt. This strong position in its basic business has allowed the company to diversify into other agribusiness operations (grain, plant nutrient, ethanol), railcar marketing, turf products production, and general merchandise retailing. Wash Rack System captures and recycles 100% of wastewater.